I have both iron levels of iron and manganese. I was also told I have iron bacteria present. Our water not only stains fixtures but also leaves a slime in the toilets. The water has a very strong metallic odor. What can be done? We recently moved into this house and all they had was a water softener. The water is not hard as far as I can tell. Originally our water also tested positive for e.coli bacteria and we worry about the area we live in, which is surrounded by cattle ranches. We shocked the well with chlorine but want to make sure our water is safe as we have children. We recommend using a chlorine injection system with a metering pump. 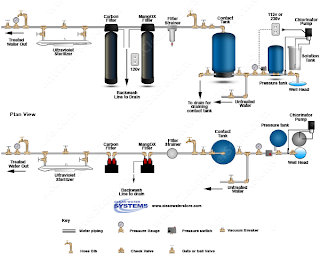 These systems use liquid chlorine, as opposed to solid pellets which are dropped in to the system periodically. The chlorine would serve to kill bacteria, and bring iron and manganese out of solution, turning them into solid, filterable particles. 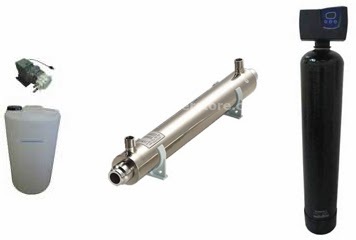 We also recommend installing a contact tank, which will provide enough time for the chlorine to kill bacteria and oxidize the iron and manganese. The contact tank could then be followed by a heavy-duty MangOxfilter to remove the iron and manganese. This treatment system would be able to appropriately address your problems with staining and iron bacteria build-up in your fixtures. As a final stage we recommend a UV sterilizer to completely remove any last traces of bacteria in your water. UV sterilization is one of the most effective methods of killing waterborne bacteria, and with a post-treatment UV sterilizer you can have complete confidence in the cleanliness of your water. However, it is important to make sure you do everything you can to protect your well head so that surface water cannot flow into the well. If you have not already done so, you might consider having a professional well driller or contractor inspect your well to make sure your well seal is not damaged or missing. In some cases if the well is old it can be resealed and reconditioned to prevent surface water from leaching directly into the well, thus preventing bacterial contamination. 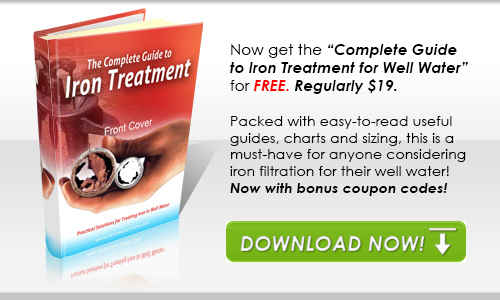 And for more information see our free guide to removing iron, manganese, and odors from well water. 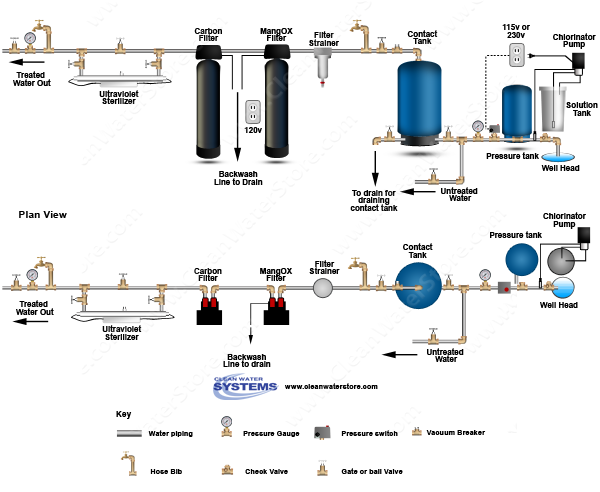 If you need any further help selecting or installing these or other water treatment systems, don't hesitate to write to support@cleanwaterstore.com, or contact us on Facebook. Good luck!